If you’re like many of my clients, you remember how much you get paid every month. 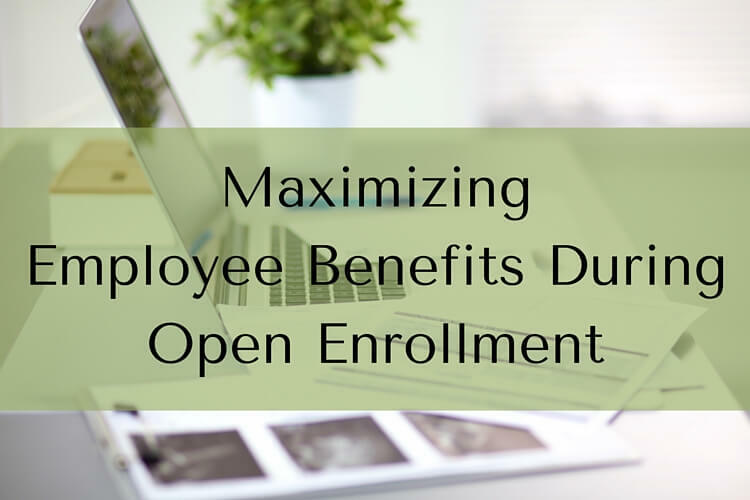 But when it comes to the details of your employee benefits, it’s easy to glaze over what’s in the fine print. Many employers offer great benefits, and you can protect your family and build wealth by taking advantage of them. Do you understand all that your employer has to offer? When the email comes about Open Enrollment this year, don’t let it stay buried in your inbox until it’s too late! It’s a good idea to review your options every year, but it’s even more important if you’ve had changes in your family or with your employer options. What does your employer offer to help you plan for retirement, and are you saving enough to be comfortable in your old age? Open enrollment is a great time to bump up your retirement savings. If you increase your retirement savings by just 3% a year, you’ll barely feel the impact on your paycheck, but you’ll get to a healthy savings rate in no time. Does your employer offer a match for retirement contributions? If so, are you getting the match? If not, you’ll want to start right away. It’s usually a 50-100% return on your money, and you won’t get it anywhere else. Is there only option pre-tax savings, or do you have the option to also contribute to a Roth 401(k) or Roth 403(b) contributions? It’s not just how much you save. You’ll also want to consider what retirement plans your employer offers. Pre-tax contributions will reduce the taxes you pay now, but you’ll have to pay the bill in retirement. Roth contributions are after-tax now, but if you follow the rules, you can take the money out tax-free in retirement. It may make sense to put a little in both if you can. Does your employer offer long-term disability insurance? If so, are you signed up for it? Long-term group disability insurance is usually reasonably priced, and anyone relying on an income needs it. Read the details of the policy to make sure you understand your options. Can you increase your coverage for a little bit more money? Do you know what the waiting period is? You’ll want a plan for making sure you have enough cash to wait out the waiting period if necessary. You should also know whether you or your employer pay the premiums for the policy. If you pay the premium, you’ll receive the benefit tax-free if you become disabled. Do you have a short-term disability policy? Hopefully you have enough in an emergency fund to handle short periods out of work. But if you are still working on building up your emergency savings, make sure you have short term disability coverage and that the time period matches up to the waiting period for your long term disability coverage. For example, if your long term disability policy has a 180 day waiting period, you want to make sure you have a short term disability policy for 180 days, or an emergency savings fund of 6 months. If you are a young family and you expect that you might become pregnant in the next year, and you don’t have short term disability insurance or maternity coverage through work, it might make sense to pay for a short-term disability policy. You’ll want to read the fine print to make sure that something like this will be covered, but such policies do exist. Is there a life insurance policy? Many companies offer some amount of life insurance for their employees, and it’s usually 1 or 2 times your salary. How much does your employer offer, and is this enough life insurance for your family? (Hint: 1 to 2 times salary is usually NOT enough.) If not, your employer might offer the option to buy additional life insurance without needing a medical exam. This can be a great option for those with medical conditions that make it difficult to get life insurance. You can also consider buying additional life insurance on the open market to supplement what your employer offers. This can be the better option as you can take it with you when you leave the job. What health insurance options does your employer offer? Out of the plans available, what plan makes sense for your family given your current circumstances? Your insurance needs change as your family changes. Is it time to add orthodontics coverage? Perhaps you or your spouse are facing health problems, and one plan has better options for visiting specialists. If you are in good health, it might make financial sense to choose a high-deductible health plan. You’ll pay less in premiums, and you’ll be eligible for a health savings account. Health savings accounts let you contribute pre-tax money to an account where you can withdraw funds tax free for qualified medical expenses. The money can be invested, and any money leftover at the end of the year rolls over to the next year. It can be a great investment opportunity as it’s tax-free on the way in and on the way out! This is different than a Flexible Savings Account, discussed below, so make sure you understand what plan you have. Most employers offer retirement plans and insurance options, but there’s a wide variety in other employee benefits from company to company. Here are a few other common options that you might have in your plan. Does your employer offer a health care flexible spending account (FSA)? A FSA lets you put away pre-tax money to cover healthcare costs that are not covered by your health insurance, such as co-pays, deductibles, and medications. These plans usually require you to “use it or lose it” by the end of the year. How much do you still have left for the current year? There’s usually a small grace period, and you might be able to roll some of the money over to the following year. If you’re at the end of your FSA year, check your balance so you don’t throw the money away. Is there a Daycare Flexible Spending Account (FSA)? You might be able to also contribute pre-tax money into a flexible savings account for day-care expenses. It’s a bit more work, as you have to pay the expenses and then get reimbursed. If you decide to skip the daycare FSA, you might be able to claim a credit on your taxes instead. Does your employer offer tuition reimbursement, pre-paid legal services, or any other benefits? If your employer offers these benefits, you might as well take advantage of them! Tuition reimbursement can be worth thousands of dollars. Legal services through your employer usually will be less expensive than if you go to find someone on your own. And there’s a wide variety in benefits, so if you read the fine print, you might find additional benefits. Your employer offers you much more than a paycheck. It’s complicated to understand the ins and outs of all of your benefits, but it’s worth the effort. By understanding your benefits, you can make sure you’ve chosen the best option for your family. Making the most of your benefits can help you build wealth while protecting your family.